The actual pressure distribution in the bearing varies based on the bearing design and other parameters but a good rule of thumb is to expect 30% efficiency. For flat pads and rectangular bearings this calculation is quite straightforward, but for journal and spherical bearings we use a few other approximations to estimate load capacity. Fluid film bearings offer a number of advantages over mechanical bearings. First, because there is no contact, air bearings do not suffer from wear or heat generation due to friction. They also exhibit no starting or running friction, even under their highest design loading. In addition, the fluid film acts to center and average out small scale errors in the components resulting in motion which can be more accurate than the individual bearing components. Air bearings also offer much higher stiffness than rolling element bearings because the air film fully supports the components, as opposed to balls or rollers which have point or line contact and are therefore limited due to Hertzian contact stiffness. While most people are familiar with oil fluid film bearings - for example the crankshaft journal bearings in car engines - most people have not been exposed to air bearings. Remembering our high school physics class, there are two basic types of fluids - liquids and gasses. In terms of fluid film bearings, the difference between these two is essentially the viscosity - liquids have much higher viscosity than gasses. When applied to a fluid film bearing, this difference has a number of implications. First, lower viscosity means that for the same working pressure gas bearings have lower load capacity (liquid fluid film bearings typically support five times the load of gas bearings for the same pad area). Second, because of the extremely low viscosity of gasses, gas film bearings operate with essentially zero static and running friction where liquid fluid film bearings have much higher friction and pumping losses within the bearings, which can cause heat generation. And third, gas bearings require very tight bearing gaps for proper operation (10 µm for gas compared to up to 100 µm for liquid bearing) which translates into extremely high accuracy requirements on the components. What this means for air bearings is that although they have a lower load capacity, gas bearings have essentially zero friction at all speeds and because the tight bearing clearances demand high accuracy components this results in extremely high accuracy motion. Another benefit is the cleanliness of using air as a lubricating fluid as opposed to oil, water, or another fluid. Since compressed air is very common in industrial environments it is probably the most often used gas, however other gasses such as nitrogen can be used where they are available (such as in clean room environments). The first question is how to generate the pressurized supply of fluid for the bearing. There are two ways to do this - one is using an external pressurized supply (hydrostatic) and the other is to use the relative motion of the machine components to generate the pressure internally (hydrodynamic or "self-generating"). While hydrodynamic bearings are common for oil fluid film bearings, which generate internal pressures quite easily due to the relatively high viscosity of oil, it is much rarer to see this technique used for air bearings because the pressure generated is quite low (although PI Nelson Air has built bearings of this type for low load, high speed rotary applications such as optical scanners). Our typical air bearings are hydrostatic (or in our case aerostatic) and use a compressed air supply to create the fluid film. This supply should be clean and regulated to a constant pressure - simple off the shelf air handling components are more than adequate for most applications to clean, dehumidify, and regulate the supply. Typical operating pressures run as low as 20 psi up to 120 psi depending on the stiffness, load capacity, and air consumption requirements. How does the air get into the bearing? After entering the bearing and being routed though internal passages, the next step is to feed the pressurized air to where it is needed - namely directly into the bearing gap. There are two basic ways to accomplish this, orifices and porous media. For orifices, the air flows through a small hole (typically .004" to .015" dia.) into the bearing area. Porous media bearings use a porous material (typically carbon, bronze, or steel) which the air penetrates through into the bearing area. The relative benefits of each approach are debatable. While orifices typically do not generate as uniform a pressure profile as can be achieved with porous media, there are ways to improve the pressure profile using a technique called "pocketed compensation". Porous media feeding provides more inherent damping than orifices, however proper sizing of the orifices can adjust damping. Orifices can become plugged if a very large particle gets into the air supply (this is extremely rare), where the porous media acts as a filter for the air. However, because of this filtering effect, over time the porous media itself can become clogged (oil vapor in the air is particularly bad) and a clogged porous bearing is much more difficult to clear than a clogged orifice. Orifice fed bearings can be made from one piece of material (particularly when using drilled nozzles) where porous bearings are necessarily made using varying materials and adhesives. At PI Nelson Air we have used both orifice and porous media feeding. Most of our standard products use pocket compensated orifices, however our LB series of linear bushings use porous bronze. Our typical orifice bearings are made using a special technique we have developed to drill the small orifices directly into the bearing, instead of using pressed in or glued in jewel nozzles. We believe that this technique reduces cost and complexity while increasing long term stability and reliability. However, jeweled nozzles are used when the design precludes drilled nozzles either because of geometry or because especially small orifice sizes (.004" for example) are required. Because of the very small gaps that are required for air bearings, the single most important factor in their manufacture is absolutely flawless geometry. Any variation in part size, straightness, squareness or out of roundness will result in a closing of the gap and will cause the bearing to lose its frictionless nature as well as degrade accuracy and load capacity. Typical tolerances on our rectangular bearings which run air gaps of ~0.0005" are part deviations less than ±0.0001" overall. This same tolerance applies over the entire length of the bearing, which for some models can be over 60". In addition, the part geometry is what determines the accuracy of the final bearing motion - even though local deviations are averaged out by the air film, the overall accuracy is dictated by how well the parts are made. Because of this, PI Nelson Air has developed a variety of techniques and equipment which allow us to meet these stringent tolerances with repeatability and relatively low cost. To start this discussion it is best to briefly define what accuracy, precision and repeatability mean. Accuracy is the measure of how closely the motion follows an ideal profile. Precision is the measure of how small the motion increments can be. Repeatability is the measure of how well the motion moves along the same path. Air bearings offer the best of all worlds because they have excellent accuracy, precision and repeatability. They offer high accuracy because the components are manufactured with extremely tight tolerances and because of the air film's averaging effects. 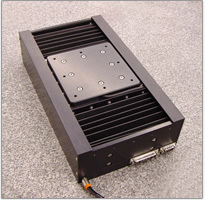 Typical linear accuracies are 10 µin/in with maximum deviation of 100 µin/36 in. 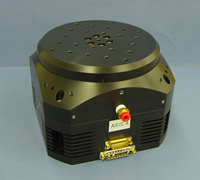 Rotary runout can be as low ±1 µin. Air bearings also offer extremely good tilt characteristics - 0.25 arcsec/in. Because air bearings exhibit no stiction or running friction, the precision achievable is only limited by the abilities of the motor/controller/encoder. 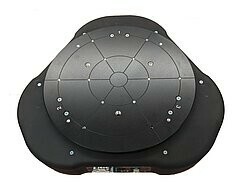 Positioning precision of ±1 encoder count can easily be achieved using linear motors. The repeatability of air bearings far exceeds that of mechanical bearings for the simple reason that they have no contact or wear. Heat generation in mechanical bearings sometimes require "warm up" periods during which there is thermal movement. Also, the mechanical preload on roller bearings can vary with temperature and cause the bearings to operate differently (varying friction for example) and lack repeatability. When working at the highest accuracy levels, these effects can cause mechanical bearings to lose their accuracy from hour to hour, day to day, or month to month. Because the accuracy of our air bearings is built into its solid metal components (made from one type of material for uniform thermal expansion), they can operate for years without any degradation in accuracy. This way, a calibration done one day will "stick". They also can be run at top speed without any need for warm-up time (excluding motor heating effects) and maintain their best accuracy. The simplest method is weight. Using a weight much heavier than the expected variation in the loading of the bearing preloads the air bearing so it rides at a smaller (and stiffer) air gap and makes it less prone to height variations. This method has the drawback of adding moving mass but can work very will with systems which already have a large amount of mass and low forces (such as parts inspection). Needless to say, this only works for bearings which operate horizontally. The second method is using a vacuum preload. A vacuum is used to apply a preloading force to the air bearing (instead of using a weight). This is accomplished by providing an area of the bearing surface over which a vacuum is applied. Because vacuum is limited to around negative 14 psi (atmospheric pressure) and typical air bearing pressures are 40-80 psi the net effect is still a lifting of the bearing, even when the bearing and vacuum areas are equal. Vacuum preload enhances the stiffness and helps to maintain constant air gap, without adding unnecessary moving mass. The main drawbacks to this method are the need for a larger bearing area to accommodate both pressure and vacuum and the requirement of a vacuum source. This method has been used successfully in many applications, especially for flat pads and planar systems which do not lend themselves to other forms of preload. The third method of preloading is magnetic preload. Magnetic attraction between a magnet on the moving part and a magnetic material on the stationary part of the bearing loads the bearing and adds stiffness. This configuration works well for linear bearings and can be very cost effective because it reduces the tolerances required for the air bearing components (as compared to air bearing preloaded systems). However, because many air bearings are made from nonmagnetic materials, it requires adding other materials to the bearing (such as iron). Another drawback is that at high speeds, the magnet generates eddy currents in the iron which oppose the motion and add a drag force (eliminating the "zero friction" of air bearings). However, in many applications magnetic preload provides an effective method of preloading air bearings. The final method is opposing air bearing preload. This method uses opposing air bearings to preload each other. 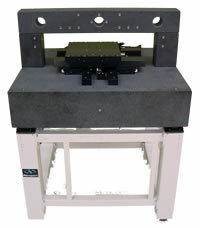 This method provides twice the stiffness of a single air bearing, although the load capacity is reduced by almost half (the other preload methods also reduce load capacity, based on the amount of force they apply) and is very effective in producing the most accurate and reliable air bearings. Because there are two air bearings working in parallel it also has the effect of averaging any errors on either bearing (centering) and can therefore deliver higher accuracy than any other method. In addition, air bearing preloaded bearings can be operated in any orientation. The majority of PI Nelson Air's standard bearings use this method because we believe it provides the highest quality, accuracy and versatility. However, this method does require higher accuracy components with more precision surfaces. Now that you understand the basics of how air bearings work, here are some of the most common configurations for using them to create motion with a variety of degrees of freedom. If you have any additional questions, please contact us and we would enjoy assisting you.